I found myself craving Brussel sprouts in the produce section of a grocery store a couple of weeks ago, despite never trying them before. I mentioned this to my mum a few hours later, and she reminded me that my grandfather had passed away that day exactly two years ago. Apparently they were his absolute favourite food, which I didn’t know about. I’m sure it was coincidence, but like…how eerie, right? 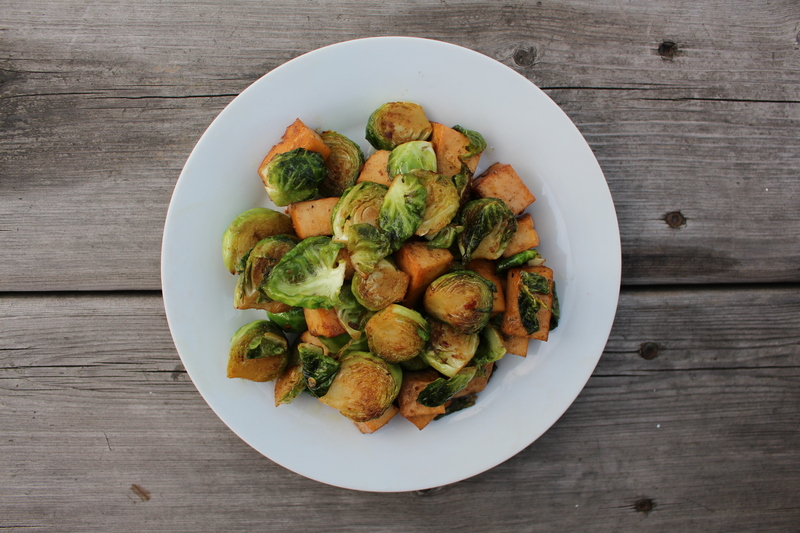 Chop stems off of Brussels sprouts and slice all widthwise. 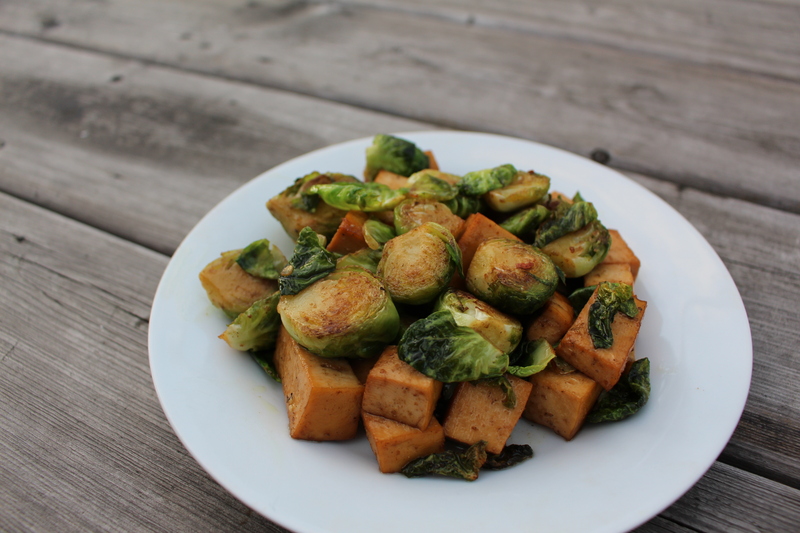 Toss Brussels sprouts in large bowl with vegan “butter”, sea salt and black pepper. Place on baking sheet covered with aluminium foil. Cook in centre oven rack and let roast for approximately 35 minutes. Flip every 5 minutes to prevent burning. Brussels sprouts will be light brown when done. While Brussels sprouts are cooking, press tofu block between pieces of paper towel with something heavy on top (book, cutting board, etc) until drained. Chop tofu into bite-sized chunks. Add EVOO to hot pan. Add tofu in a single layer and let cook until tofu begins to brown. Sprinkle soy sauce, garlic, nutritional yeast, thyme, chilli flakes, sea salt and black pepper on top. Flip tofu, and toss to coat with additional seasoning. Continue cooking until tofu is browned. Remove from heat and set aside. 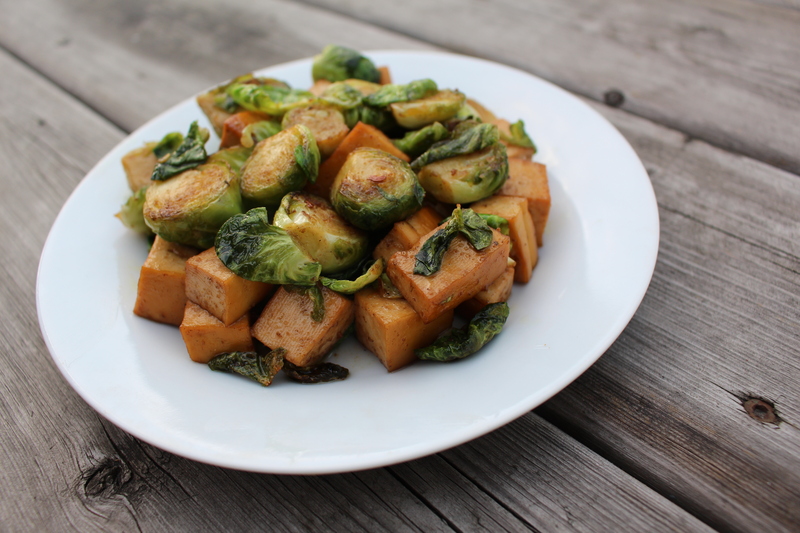 Combine tofu and sprouts. Serve immediately.